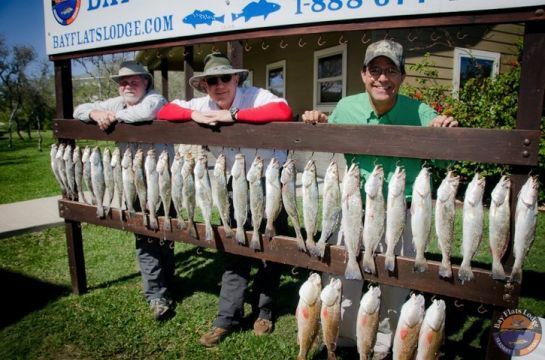 Recreational fishing on our Gulf coast is ever-changing, and the popularity of the sport continues to grow faster than that of collegiate-level lacrosse in today's America. Youth and elderly, amateurs and experts, genuine Texans, and other folks from all parts of the globe have recently showed an increased interest in a chance at learning and discovering all that our coastal regions have to offer in the way of Texas saltwater angling. And one of the more notable groups of people to venture into this realm lately has been the women. We've had the pleasure of hosting many women's groups over the course of the past few years that have been true producers when it comes to photo time at the end of the day. Now then, I know there are a lot of us guys out there that'll swear that part of the pleasure that we experience from being out on the water while fishing comes from the fact we have been successful at freeing ourselves from the confines of female control. But I'm here to tell you that I can honestly say to a lot of men out there that they can only hope to someday become as good a coastal angler as that of some of these women have proven to me to be. A lot of these ladies simply have it going on when it comes to fishing. They show up ready to fish, and they show our guides the true meaning of what it sometimes takes in order to make a name for themselves as a minority in an otherwise male-dominated sport. If you happen to find yourself fortunate enough to be wading alongside one of these talented ladies next time you're out tossing one of your favorite plugs, you may wish to consider giving things your best effort, as in failing to do so might just result in her embarrassing you at the cleaning table at the end of the day. Over the years, many of you may have heard of the term "prospecting". Definitions of the term include the infamous California gold rush of 1848. The dictionary defines it as a meaning to explore an area, especially for mineral deposits; or to inspect (a region) for mineral deposits. I, too, have adopted a similar meaning for the word "prospecting", but my definition denotes a somewhat different indication. While it's true that I do tend to explore and inspect a lot of different spots and areas on a regular basis, I'm not looking for silver and gold in the mineral sense - my quest is simply the constant pursuit of silver-backed speckled trout and gold-shouldered redfish. Now then, more times than not, our Gulf winds dictate how we're going operate our fishing activities on any given day down here along the coast. That's why I regularly speak to you about fishing the conditions, and not simply fishing your favorite spots. I prospect new locations in each different wind condition, and what I've learned from doing so allows me to share the following analogy with you...Go to your kitchen pantry, open the door, and make mental note of the numerous and many different varieties of food groups. Now imagine each of the boxes and cans as being different varieties of wind conditions (instead of food groups). For example, while taking inventory of the pantry, you happen to note there are four boxes of SSE wind at 5-mph, but only one box of NW wind at 25-mph. If, however, while on your next fishing trip, you find that you happen to be facing a NW wind at 25-mph, you only have one box to choose from in a pantry that contains many different choices. This particular scenario puts a lot of us in a sudden state of distress as to us knowing where to go from there, and many of us tend to begin to second-guise other available options - only due to the fact that we have not properly prospected other areas or regions. Another common example is that a lot of us often experience anxiety in the fact that we've been waiting all week to go fishing. We finally make our way down to the coastal town that we'll be fishing out of only to find that heavy winds have the tops of the palm trees bent over in the pre-dawn hours after we've awaken from a short night's sleep. We immediately think to ourselves that there's a strong possibility that our favorite fishing spot may be blown-out. However, we seem to remember our favorite spot is sufficiently protected from a wind coming from this direction, so we pack up our buddies and their gear and make our way across the bay, only to discover upon arrival at our favorite spot that another early-riser beat us there, or that someone pitched a tent overnight in order to beat everyone there. There goes your spot - enough said? This is why I always prospect, remembering to never limit my opportunities based solely upon those areas which are most familiar to me. I always make it a practice to build wind conditions into many different equations and scenarios. PHOTO: Greg P. and guests enjoyed drift fishing with live shrimp - "Just the night before winds were gusting 50 mph and turned San Antonio Bay upside down"...You never know, unless you go! Captain TJ Christensen did an excellent job putting them on the fish. FREE Tee Shirt "That's How We Roll" for the BEST analogy related to this article.